When we arrived in the dining room for breakfast, food and bags were already set out for our lunches. Three kinds of bread, four kinds of cold cuts plus cheese, all the sandwich-making veggies, and cookies, fruit, and carrots and celery sticks. The full hot breakfast included waffles and strawberries—we were not going to go hungry. Our first hike of the day was the Sasquatch trail. 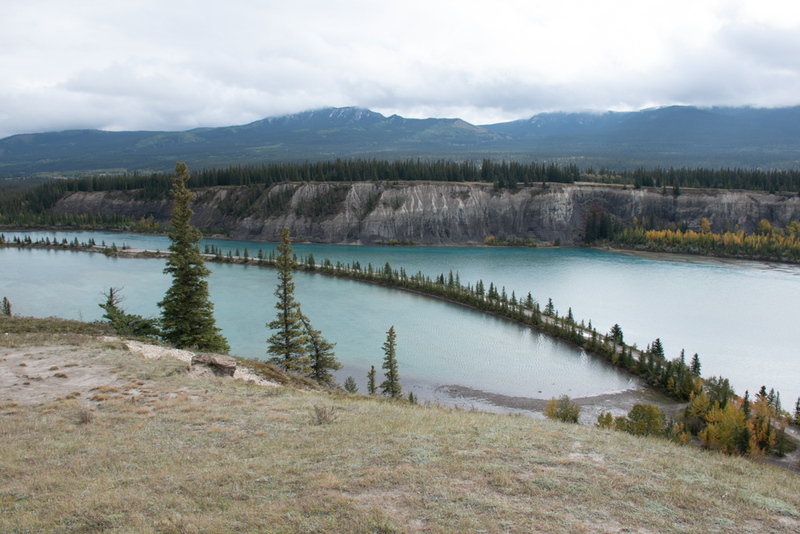 From Highway 11, the road took us over a spillway, past the power plant, and up to a broad parking area at Abraham Lake, from where we walked to the levee. 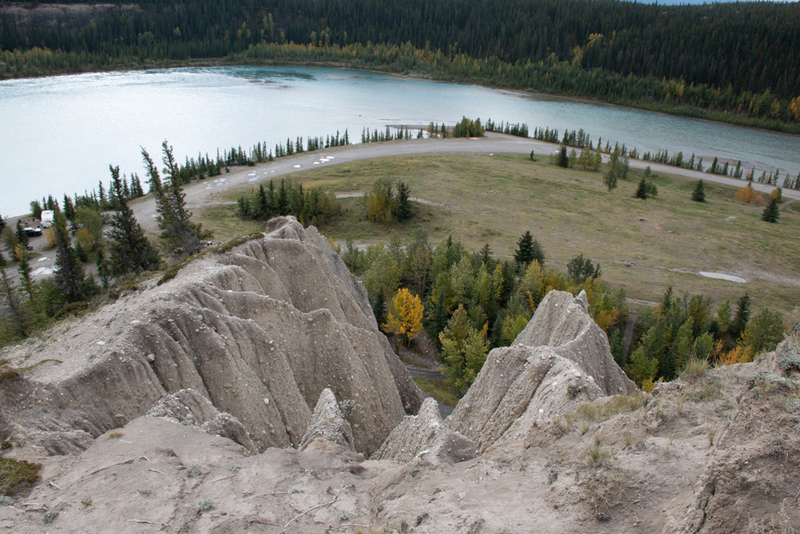 The lake was formed in 1972 when they built the Bighorn Dam on the North Saskatchewan River right in this area. Even though the lake is “artificial,” you would never know it by looking at it. It has the same beautiful blue colour of all the natural mountain lakes here. The levee walk is easy and picturesque. It’s perfectly flat and you have water and mountains on each side of you. Returning to the start of the levee, we searched for the head of the Sasquatch Trail, which was supposed to be a gentle climb up to the top of the ridge. Four of us scrambled up the side of the soft, crumbly slope to see if we could spot the trail from the top, while the others followed along at the bottom of the ridge. We knew we were in the right place when we found the survey marker at the top, leading us to conclude that the original path had eroded away. Before we left the area, we stopped at a memorial and commemorative teepee constructed of copper, but now turned black. A plaque informs us that this area under the lake was the ancestral home and spiritual and cultural strength of the Stoney (Nakoda) people. The teepee overlooks the Bighorn Dam. On to the Allstones Creek staging area where we ate our lunch either in the cars or standing outside in the drizzle. Then across the highway and into the gorge of Allstones Creek. The gorge walls are an unusual site—almost completely vertical layers of red stone, now even more colourful because of the drizzle. Along the south bank, blankets of thick moss cover the stone. 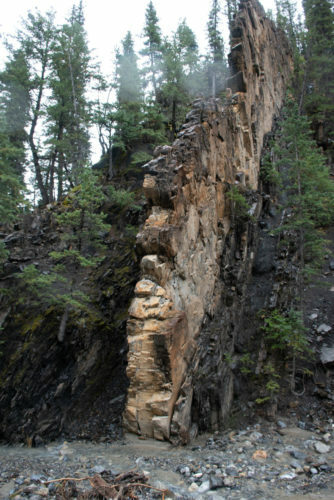 We skipped over the creek bed, jumping back and forth, and sometimes into the water to make our way through the gorge. The water was considerably higher than it was when it was scouted before last week’s snow. 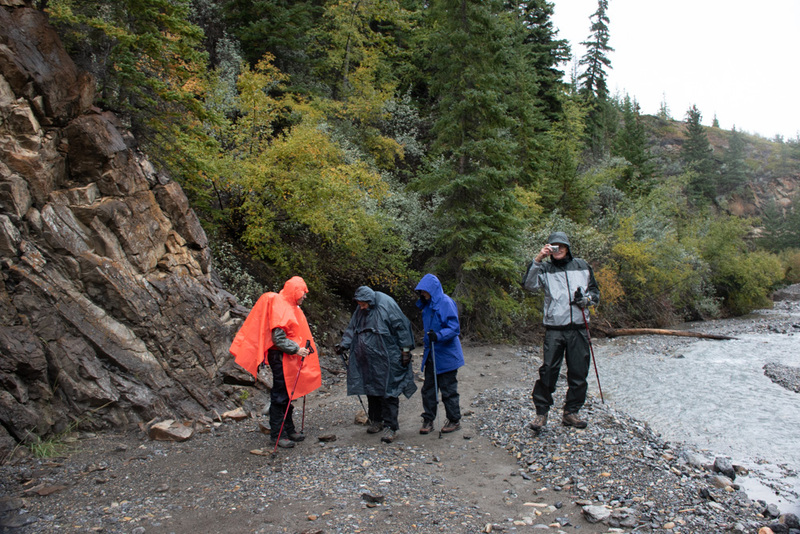 This fording and jumping activity wasn’t for everyone, so half the group turned back to the staging area. Eventually, the rest of decided that, even though it was fun, we had had enough too. Last hike of the day was a connector trail to Dry Haven that started at the Goldeye campground. The faster group made it all the way, the slower group inadvertently turned at a bridge and ended up at the Centre of Outdoor Education (COE). The owner, who was the uncle of an acquaintance of Anita’s, gave us a tour of this rather glamorous retreat which features a pine, sky-lit building designed to resemble a yurt. Yoga retreats are held here. Supper in the evening was chicken wrapped in bacon and stuffed with cheese. Dessert was panna cotta with strawberry coulis.